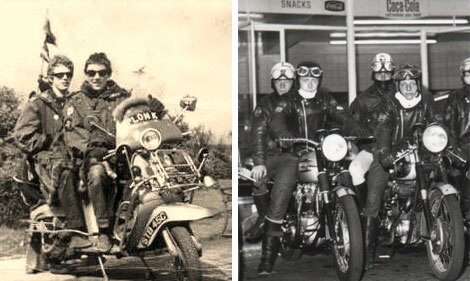 “Are you a Mod or a Rocker?” was quite a common question at School, College or the Workplace during the mid 1960’s. Unless you were covering it up though, it was reasonably easy to tell. Mods had short hair, Rockers had long hair combed into shape with Brylcream or of the like. Mods would waer Duffle Coats, Rockers would wear Leather Jackets often with a few medallions or have devilish slogans on them. Mods had drain pipe trousers, Rockers had Jeans or Leathers. Like so many things in the 1950’s and 1960’s much fashion and social trends derived from the music of that time. Rockers were still in the Bill Haley days whilst Mods were finding their feet from the music of The Who. Of cousrse, the main definition or identification was in their means of transport (if they could afford it). The Mods would parade around on their Lambretta or Vespa Motor Scooters whilst the Rockers would cruise around on their BSA., Royal Enfields or other heavyweight Motorbikes of that time. Tensions between the two came to a head in 1964 when no Bank Holiday Weekend would be without both factions heading in large numbers to any popular Seaside Town with sole intent to wind and provoke each other up. Fights would inevitably take place thus spoiling it for the ‘normal’ families trying to have a pleasant playful day out on the Beach. Unfortuneately many of these days resulted not only in face to face brawls but damage done to properties, mainly Shops and Cafes along Seaside Promenades. Arrests were made by the dozen and for days after the Bank Holidays clearing up and repairing damage took place. As with many ‘fashions’ of any time, it was probably made worse by media coverage. Mods and Rockers knew that if they went to one of the major Towns such as Brighton, Clacton, Bournemouth, the Press would be there waiting and it was quite a thrill to have a picture in the Paper or a short clip on the TV Newsreels. Mods seemed to diminish faster than Rockers, why I don’t know, maybe the natural progression from a Scooter to Car was a more comfortable option. After the fuss had died down, along came the Hippy era and although this didn’t causes clashes, it provoked a need for rebellious behaviour against society. The times certainly were a’changin ! Nowadays it’s nice to see the occasional numbers of Bikers making their way to a Bank Holiday meet up somewhere and many of these people are into a lot of charitable work, especially at Christmas Time when many Bikers visit local Hospitals with gifts for Children. I lost my beautiful daughter and her partner to a motor bike accident when she was only 25 years old. They were preparing for a Bikers Meet Up the next day. Word soon got around and at the funeral, about 20 Bikers led the Procession through Hastings Town Centre, at the Church itself there were probably 100 Bikers from all over Kent and East Sussex. The days of faction and violence ended back in the 60’s. Now both Mods and Rockers respect each other, probably chat amongst themselves, are proud of what they are, what they do and…….good luck to them.